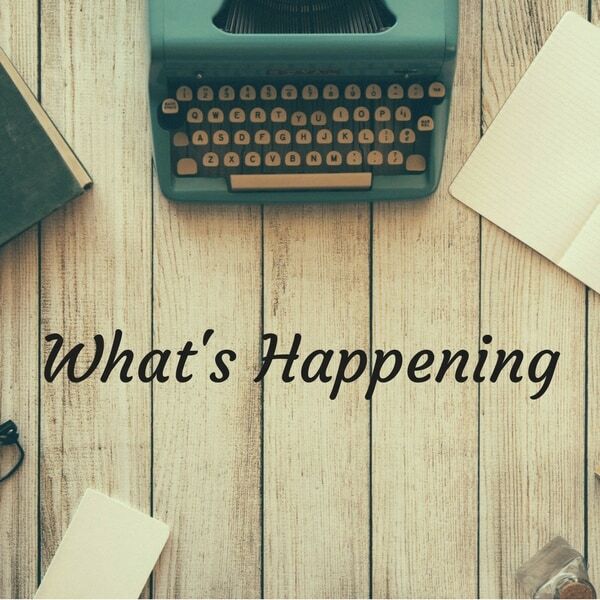 The fifth edition of my What’s Happening series, where you get a sneak peek into what I’ve been up too and what I’m loving when it comes to all things food, natural beauty and more! I’m a little late… did you notice? I normally try to get my What’s Happening posts up on the 1st of every month for a recap of the previous month, but I didn’t even realise it was July until Sunday… and then I was too busy chilling on the couch to organise this post. But here it is! June is over and we are officially half way through the year! Crazy! June was a MUCH better month for me! My niggling health problems have all but gone away. Adam surprised me with a beautiful brand new car (Mazda2) during the first week of June and I’ve been trying to find any excuse to drive it around! He also managed to snag some Ed Sheeran tickets for me after I had failed to get them after 2 hours of fighting with the ticket website! And I got tickets to see My Favourite Murder when they come out in September and could not be more excited! We also went to Singapore for a week at the beginning of June but that feels like it happened years ago, not weeks ago! Singapore was OK but I wouldn’t advise anyone to spend a week there! You can pretty much tick off all the must-see sights in a day or two! We did have fun together though and I managed to get a whole bunch of work for the blog done while Adam had to work over there. No Pong Deodorant (Bicarb Free) – I’ve used No Pong Deodorant before but found their version with bicarb irritated my underarms and I did get a slight rash. My underarms are SUPER sensitive! Their Bicarb Free Deodorant has been perfect though. No rash. No B.O. Easy to apply. Very happy customer right here. Silicon Valley – This has to be one of the most clever shows on TV. So many twists and turns and so many laughs. Highly recommend! Man on Fire (Chris D’elia) – If you have Netflix you have probably seen Chris’s new comedy special pop up. We saw Chris around this time last year when we did a road trip around New England. We actually changed our entire road trip to go in the opposite direction just so we could time it perfectly to see him in Rhode Island and it was so worth it. We were laugh crying the entire show and most of his Netflix special is exactly this routine. So worth watching for the belly laughs! The House – A really silly movie. Funny, yes. But silly. I love Amy Poehler and Will Ferrell and they were a good combination but I would suggest waiting until it comes out on DVD / Netflix. It’s what my parents used to call a “DVD movie”. In the Dark (Podcast) – As if it is a surprise I’ve been listening to another crime podcast. This one follows the case of Jacob Wetterling, who was abducted in rural Minnesota over 27 years ago and until recently, the police had no answers as to what had happened to him. The series questions whether the police could have done more to help find out what happened to Jacob earlier, and covers some other cases from around the same area. I found the series very interesting as well as sad. I’m glad the family now has closure but awful to have to wait so many years without answers. The Stranger Beside Me by Ann Rule – This book gets mentioned quite a bit on the My Favourite Murder podcast so I was interested in giving it a read. The book is about Ted Bundy, and Ann worked with Ted at a crisis call centre and maintained a friendship with Ted throughout the years. I haven’t been able to put the book down. I must admit I didn’t know too much about Ted Bundy prior to reading the book and his crimes were truly heinous. If you are interested in true crime, this book is extremely well written and tracks Ann’s thoughts on Ted before, during and after his trails. She’s even written updated passages as the years have gone on. I HOPE YOU ALL HAVE A HAPPY AND HEALTHY JULY! I have similar feelings about Singapore. It is ok, interesting, but nothing to do more than 2 days. I didn’t feel the vibes that would make me want to spend more time there or even come back. I’m so relieved I’m not the only one Veronica!! I’m so jealous you are getting to see Ed Sheeran! And the new car?! You had a great June. I certainly did – if only every month was like that!! Ed isn’t here until March next year so currently counting down haha! Good to know that June was awesome for you! It was a busy month, so much stuff to prepare for July and our vacation. I just can’t believe we’re half way through the year though! Time flies! It’s crazy to think we are over half way now! I’ve also had trouble with different deodorant brands irritating my skin. Maybe I will try that biocarb deodorant as well. I just wrote a post recently about switching to organic – you just have to find a bicarb free deodorant because its the bicarb soda that causes rashes. That books sounds like a great, creepy read. I will have to add it to my summer reading list. That book sounds fascinating. You always wonder about serial killers and why the people that knew them never saw “it.” Actually reading someone’s perspective that lived that would be interesting. Thanks Paul! He did good! I wouldn’t mind being surprised with a new car! That is so awesome! I will have to check out the podcast – I love mysteries! They are pretty much all I listen too! It’s so nice to see the positive and fun things people are doing in their lives. That books sounds like a good read, I may have to pick it up. Love apple crisps. I’m finishing the 2nd book of a trilogy right now. I absolutely love reading!! I would love to try those apple crisps. They look so good. I really want to try them, I think they’d be a hit with my kids too! I’m obsessed with podcasts. I list to way too many and yet I keep adding more to the list. It’s a problem. Haha sounds like my kind of problem! I was so excited to see the boys coming out ahead on Silicon Valley. It’s one of my favorite shows but sometimes the constant mishaps or failures get a little old. I agree Cindy!! It was a great ending this season! Thank you for a good read and for the lists of July favorites, I found many ideas for what to consume here! I must start watching Silicon Valley and Man on fire.! Earlier this week I was looking for an apple pie recipe just like your apple crisp recipe. I’ll try this recipe today (we have a lot of apple slices in the freezer). I hope you have a happy and healthy July too! Perfect timing then Cecilia! Hope you enjoy! It’s definitely a great place to stop over. If you are heading over to Australia you will probably stop there anyway so a couple of days is heaps! Or any other asian country too – particularly Hong Kong etc. I am now thinking of reading this book, The Stranger Beside Me. I find it so intriguing! Enjoy the rest if your July! Yeh I need a new series too! I love the format of this. I enjoyed seeing what you are reading and what you happen to be listening to! Sounds like you’ve had fun this past June. Like you, I can’t believe we’ve already gone through half a year. Funny story – my son and I both love ed shoran. He is 3! Looks like you’ve been busy lately. That’s a good thing. first of all WHAT?!?! how exciting congrats on the concert and the new car! i love his music!!!! this summer I am planning on taking time for me, bing watching Netflix and improving my yoga skills hehehe. Thanks so much Andrea 🙂 I haven’t tried yoga ever if you could believe! I really want too though! Damn it!! Ive had that happen to me before and it’s such a bummer! He’ll definitely be around again! Congrats on the new car! That is so exciting! Also I always fail when trying to buy tickets, but my husband always finds the best seats for awesome prices, it’s so frustrating! In the Dark sounds so interesting and sad. I’ll check it out. Omg you went to Singapore? How awesome!! I’m super excited to see the House! I think that movie looks hilarious! It was definitely funny, just not one I’d rush out to see at the movies haha. I don’t know there’s something about going to the movies that if the movie isn’t fantastic I feel bummed! Our family is enjoying the Individual Apple Crisps. I am so new to YouTube… how on earth do you find good YouTubers to follow? So good! I haven’t really gotten into youtube that much myself! The only things we watch on youtube are all of the late night programs clips because they aren’t all played over here in Australia! We love Seth Meyers and Jimmy Kimmel! This No Pong deodorant has peaked my interest! It sounds like Adam is a keeper! He so is 🙂 Thanks for stopping by Sheena! Thanks Ali!! I can’t stop listening to all the true crime podcasts! You got pretty great June. Good to know that your health problems had finally gone! Have a wonderful July! I am currently watching Pretty Little Liars and Orange Is the New Black. I am reading a book about the history of Christmas. That book sounds really interesting – I can’t say I know that much on the history of Christmas! Aww I’m glad you’re better now! Whew what a weekend! Have fun on this month on July! Nice site. Interesting idea to do a monthly summary, never thought of it but could be good. Do you ever guest blog? Thanks Sarah 🙂 yep, I guest blog! Your month sounds amazing! I have totally loved your food ideas over the month. The avocado and sweet potato salad was awesome and those apple crisps have changed my snack foods for the better! Thanks lovely!! Appreciate it 🙂 And yes – June was a fantastic month for sure!! Wait Ed Sheeran tickets and a new car? I think you’re living in my dreams or something! You lucky duck! I’ve got to try those individual apple crisps… they sound delicious! Haha when it’s said back to me it sounds a bit braggy! It was definitely not an average month LOL! The apple crisps are so good! Creating an on-site wellness program is important, specially nowadays that instant food are rampant. This is a good reminder not only for adults but also for youngster. Thank you for a good write up. Slightly confused by this Eliza but none the less thank you for stopping by! What a refreshing post! I would love to snag some ed sheeran tickets!